Motor unit recruitment is a seemingly straightforward process as I covered in part 1 and part 2 of this series. But like anything with the human body, eventually a simple explanation becomes, well, not so simple once you look at physiology on a microscopic level. Just consider the myriad of tasks your motor units must respond to, from explosive “fight or flight” physical reactions to strenuous isometric contractions to landing on a dime after unleashing a double backflip from the uneven bars. Does the nervous system always follow the same motor unit recruitment pattern, regardless of the task? Before I get to that, let’s recap what I’ve covered so far. Muscle contractions are controlled by your nervous system and motor unit recruitment occurs in an orderly fashion as more force is required. In the gym, force increases when you lift a light weight faster, or when you lift a heavier weight. Light weights recruit your smallest/slowest motor units, and then additional larger/faster motor units are recruited as force escalates. Indeed, when I finished my graduate work in neurophysiology in 2005, an orderly recruitment of motor units was still considered the best explanation of how the nervous system responds to demands for higher force. But science, like any other reputable discipline, eventually evolved to the point where more precise testing methods could paint a clearer picture of what’s really going on. In 2006, Wakeling et al (J. R. Soc. Interface, 3, 533-544) released a study that analyzed muscle fiber recruitment in the three plantarflexor calf muscles: soleus, medial gastrocnemius, and lateral gastrocnemius. What they found was surprising. By using EMG analysis they demonstrated that the medial gastroc muscle could preferentially recruit the fastest (largest) motor units, even when the slower motor units could still fire. This research is intriguing because it flies in the face of the orderly recruitment postulate. According to the size principle, if the largest motor units are recruited, the smallest motor units must be working at full force to keep up. However, Wakeling’s team demonstrated a drop in activity from the smaller medial gastroc motor units while the largest ones were working at breakneck speed. How was this possible? 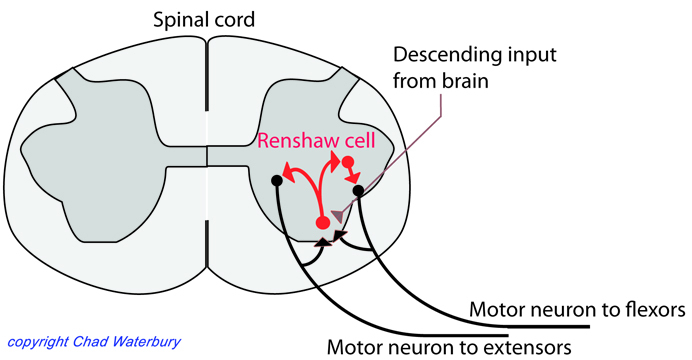 According to the study, an interneuron in your spinal cord, the Renshaw cell, can inhibit the small/slow motor units. Look at the image on the right and you’ll see two motor neurons (in black) that exit your spinal cord and control your muscles. You’ll also see an arrow from each motor neuron that feeds information back to the Renshaw cell (shown in red). 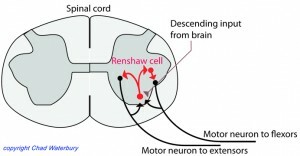 This Renshaw cell takes information from the motor neuron and can inhibit the small motor units in order to favor the large motor units. Think of the Renshaw cell as being a general in the military: it distributes fire power to the units that need it most. Too much science? Ok, let’s step back and look at the big picture. Everyone knows that getting bigger and stronger requires you to lift heavy. But some people still aren’t sold on the importance of fast contractions with submaximal loads. Even though this research demonstrates that the size principle might not hold true in every muscle contraction, it still gives credence to the point I always try to make in my books and seminars: you must tap into the largest motor units to get rapid results. The Wakeling study is just another piece of science which helps explain the power of explosive contractions to get you there. How did Wakeling’s team target the largest motor units? With fast contractions. Here’s a line from the paper:— any idea on the load used for this fast contractions? more then 50 percent of 1 RM? CW: They used cycling for the exercise, therefore a typical % of 1RM wasn’t outlined. The key is that they hit the largest motor units with faster contractions instead of harder (ie, heavier) ones. Absolutely awesome article series! Thank you! do you think that fiber type dominance in people should affect the way they approach training? for example, should a slow twitch dominant person also go for the 3 or 5 rep approach or for the 10, 12 rep approach? CW: A slower twitch person can still benefit from shorter sets when strength with muscle is the goal. Is it true that even heavy contractions can recruit slow muscle fibers if lifted slowly? Explosive training is key. However there seem to be other benefits of slow lifting, such as more targeting of the actual muscle. Explosive lifting targets the tendons more, and cannot be sustained as long as slower lifting and therefore less work may be performed. The study that compared 90% 1RM to 30% makes this somewhat more clear. CW: Sure, with heavy weights the tempo isn’t as important – although it’s beneficial to try and accelerate the lift. Also, don’t confuse plyometrics with simply accelerating the lift – plyos work tendons while accelerated lifts when performed correctly activate more motor units than slower lifts. hi chad. great article, thanks and happy new year. 1. You are talking about certain amount of seconds to recruit all possible for voluntary recruitment motor units. Where and how this amount come from? Is that the same for everyone? 2. If not, how to find a method to diagnose this time for individual sportsman? Appreciate your explanation or reference to some other articles. CW: Hey Alex, first off, I agree that there were many, many questions unanswered. “Principles of Neural Science” is over 1400 pages and it doesn’t cover everything. So there’s no way I could even scratch the surface – I just hit on a few important points. 1. It’s based on the energy supply for the largest MUs. Those fibers use the ATP-PC system, and it runs out in 10 seconds. 3. Yes: focus, focus, focus. Also, it helps if you’re in a life-threatening situation – although that’s not recommended. 4. Yes, there is some evidence, especially in animal studies (but those don’t count in my book). The jury’s still out, but it appears that the body can find ways to sometimes alter the MU process. I’ll discuss this more later on. so the cycling used for the paper should have been with heavy resistance? CW: My recommendation to keep the load above 50% was to help people realize that it’s tough to recruit all the motor units with very light loads. There’s no way to accurately determine if, say, 30% of 1RM with explosive tempos can recruit all your MUs – maybe it can, but based on the research, it would be harder to accomplish. Comparing your various training programs, you seem to prefer sets with 15+ reps vs 3 reps explosive training. Is there a reason for this, considering studies such as these? Do you perharps suspect that the 10×3 (and similar) variations recruit similar MUs as explosive training does, causing you to be vary of including both in a given program? PS! Thanks for great food for thought! CW: I’m not sure I follow your question. For the most part, I favor short sets (3 reps) over longer sets. This is especially true when training for strength, hypertrophy, and explosive strength. I like higher rep sets for metabolic enhancement, that’s why there are many variations in my fat burning program, Body of FIRE. I was wondering is true that if you try to lift a submaximal load explosively that still makes you reach close to failure on your set for higher reps like 15, would it cause your strength and explosive power decrease by altering some of your fiber makeup. 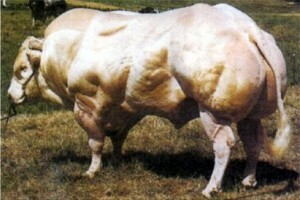 I am saying this because its seems like it would mean training the type 2b muscle fibers for endurance. CW: Good question. First off, it appears from the research that you can convert large type IIB fibers toward endurance characteristics. This is something any explosive, power athlete should not want. The key for building size/strength is to keep your sets under 10 seconds. Lift heavy and lift lighter loads explosively to tap into your largest motor units. If you do this, you won’t convert those fibers toward endurance. Also, keep in mind that the length of the set (time) is what matters, not the reps. You could crank out 15 reps in less than 10 seconds if the load is light enough. If the load is too heavy and those 15 reps take you, say, 20 seconds to complete then you’re training endurance. Thank you so much for this series of posts. I implemented this idea into my training and in a single week I’ve vastly improved my strength and power. I feel muscles working that I likely haven’t felt in a long time. I can’t wait to see what my results are in a month from now. Your message of explaining the science behind exercises is always easily digestible and tangible in the field.